Thanksgiving Noms - My Suggestions. 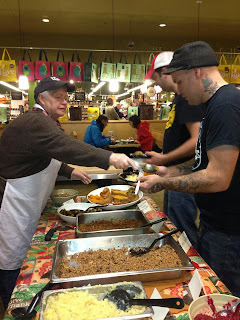 This week, I had the pleasure to host at my local Whole Foods Market their first "Vegan Thanksgiving Tasting." In collaboration with Morag Keefe, Demo Coordinator, & Lisa Sands, Marketing Director, we planned an evening where guests could sample items off the WFM holiday menu, along with try recipes I felt would be sure-fire hits. Plus, it was FREE. We had a really nice turnout. Guests were served quinoa stuffed butternut squash, green bean casserole, maple roasted brussel sprouts, farro stuffing, olive oil mashed potatoes, mushroom gravy, cranberry orange relish, gardein roast, & pumpkin pie. No one left hungry, and I am pretty sure most left with a few ideas for the holiday table. Two recipes mentioned are found in Isa Chandra Moskowitz's "Appetite for Reduction" cookbook, "Ginger Mashed Sweet Potatoes & Apples" and "Polenta Stuffing." The "Curried Pumpkin Soup" is sold by Whole Foods Market as a part of their "Health Starts Here" product line. Well, this blog entry has certainly left me hungry. I would love to hear what is on your menu next week!